While in Wiltshire enjoying a week's holiday we just had to visit the famous medieval Salisbury Cathedral, and do the Tower Tour too! Then across the cathedral lawns we headed to the fascinating South Wiltshire Museum and learnt all about Stonehenge in the enlightening Stonehenge gallery prior to heading to the World Heritage prehistoric monument itself at Stonehenge, and onto the mysterious great stone circle at Avebury. 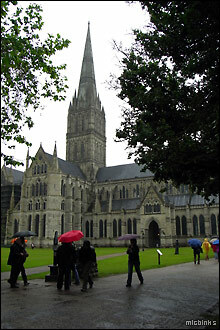 So here's our pic outside the magnificent Salisbury Cathedral. We took the efficient park & ride into Salisbury city centre which worked out well and cost a reasonable £3.50 to park and bus in. Wow... just look at that architecture! 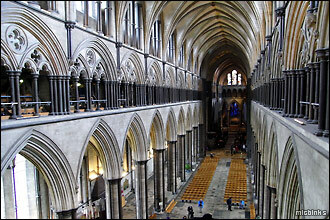 The 13th century Salisbury Cathedral is early English Gothic style and was built in 38 years. 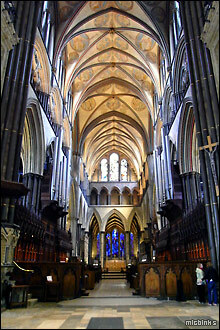 This shot is looking towards the proficient Quire with the Altar beyond. 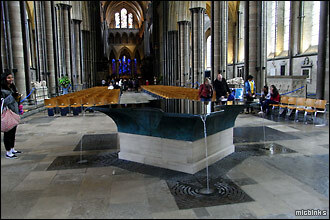 The Font here in the Nave must be the newest part of Salisbury Cathedral as it was installed in 2008. 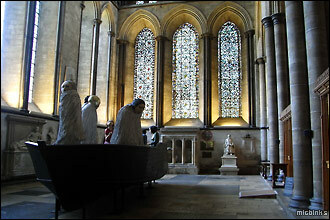 Hmmm... we're not sure what these figurines in a boat in the North Transept part of the cathedral depicted. We did the exhilarating cathedral Tower Tour (cost £10 inc. cathedral itself) to climb the 332 steps up to the spire, the tallest in Britain at 123 metres. On the way we got this fantastic view down into the Nave. Prior to climbing the final bit up a very narrow spiral staircase, our Tower Tour guide parked us here and explained the workings of Salisbury Cathedral's clock, the oldest in Europe, within that wooden housing. Safely back down (and with rather wobbly legs!) we headed for a calming coffee in the cathedral café before making through the cloisters (yes, the largest in Britain) to view the world's best preserved original Magna Carta - no photos allowed sadly. 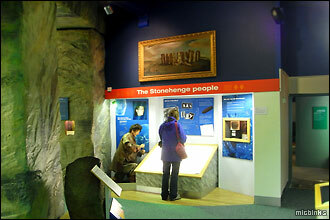 ...explore the award-winning Stonehenge gallery. 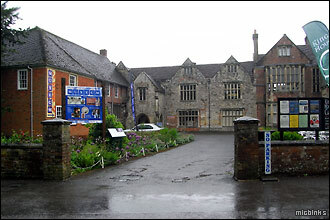 Entrance to South Wiltshire Museum cost £5.40 adult each but we used some 2 for 1 vouchers from Visit Wiltshire, details in our tourist resources section. 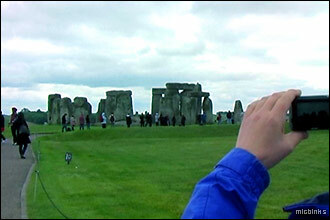 Next day and it's iconic Stonehenge of course, following in the footsteps of countless other tourists. 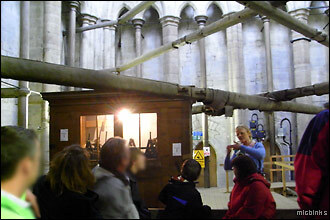 And even on the somewhat dull day we visited, there were oodles of other visitors too! 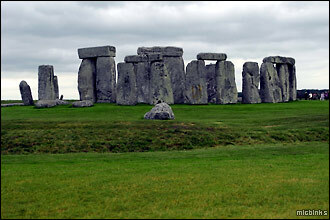 The monument at Stonehenge is a World Heritage Site dating from prehistoric times. 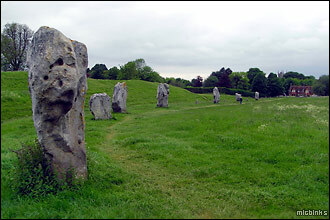 The stones are aligned with the rising/setting sun at the solstices and it's unclear how - or why - ancient man moved them here from the Prescelly Mountains in West Wales. 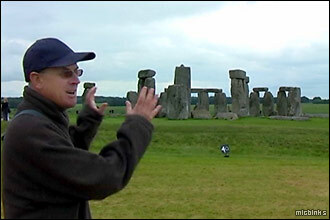 No, Mike's not pretending to push the stones over, this still's from the video we shot as he did his bit to camera describing how in a previous childhood visit he carved his name on the stones. Can't get near them now unless you're a Druid or a Pagan! ...and finally a pic of the Heel Stone at the end of The Avenue which, along with the Slaughter Stone, lines up with the rising sun at the summer solstice. 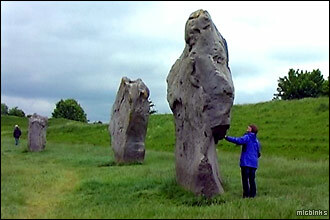 Well, we hadn't had our fill of mysterious monuments so headed up to Avebury to view the weird stone circle there. This megalithic monument is another World Heritage site and was built between 2,850 and 2,200 BC, which is even older than Stonehenge. 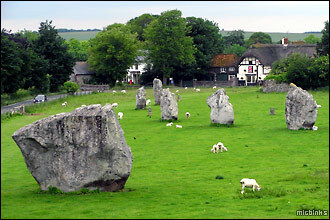 The stones form a huge ring a quarter mile across surrounding the village of Avebury, and, just like its more famous neighbour, it's unclear why it was built. 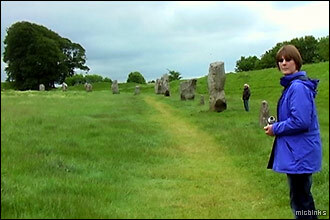 Unlike Stonehenge however, visitors can wander freely among the stones. ...have been mooted as to the reason for its existence, often involving ritual and sacrifice. Nearby there's a Stone Age burial site at West Kennet Long Barrow and the huge man-made mound of Silbury Hill which add to the mystique. 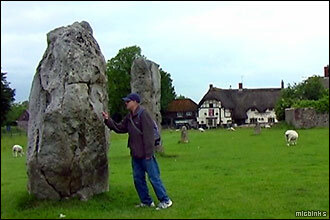 Mike had a go at prodding the stones, just to make sure they were real and not made of plastic! Hey, is that the pub over there to lose Mike in for hours? 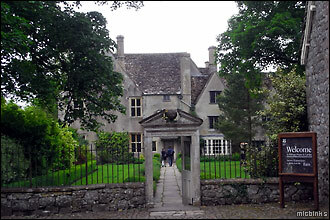 Here's the manor house and gardens at Avebury; we didn't go in (cost £9) but it was the location for the BBC production 'The Manor Reborn'. 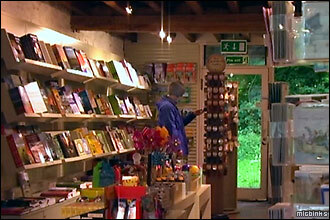 There's also Avebury Museum (£4.40) with displays from Alexander Keiller's 1930s excavations and, of course, the gift shop to lose Belinda in for hours! 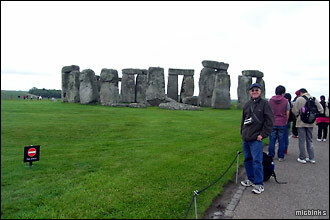 Our entrance to Stonehenge was (adult) £7.80 each at the time of our visit. We considered The Stonehenge Tour bus (see our tourist links), taking in Stonehenge, Old Sarum and Salisbury Cathedral at £24 each, but this would have been more costly for us, despite petrol savings, as we already had 2 for 1 entrance tickets for some of the attractions, plus it wasn't flexible enough to allow us time to do the Tower Tour or South Wiltshire Museum. 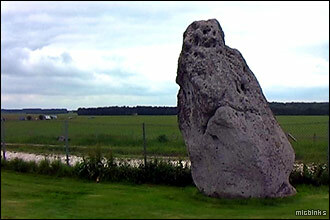 Avebury Stone Circle was free except for the car park at £3 (£5 before 3.00pm). 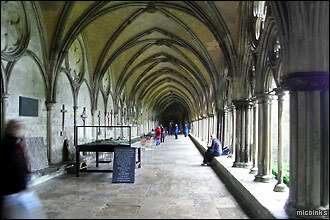 Guided tours of the stones can be arranged at the gift shop and there is a café. while a bit further away St Davids Cathedral in Pembrokeshire.